^ Yarshater, Ehsan. The Cambridge History of Iran, Volume 3. Cambridge University Press. 1993: 482. ISBN 978-0-521-20092-9. Of the four residences of the Achaemenids named by Herodotus — Ecbatana, Pasargadae or Persepolis, Susa and Babylon — the last [situated in Iraq] was maintained as their most important capital, the fixed winter quarters, the central office of bureaucracy, exchanged only in the heat of summer for some cool spot in the highlands. 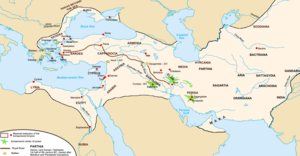 Under the Seleucids and the Parthians the site of the Mesopotamian capital moved a little to the north on the Tigris — to Seleucia and Ctesiphon. It is indeed symbolic that these new foundations were built from the bricks of ancient Babylon, just as later Baghdad, a little further upstream, was built out of the ruins of the Sassanian double city of Seleucia-Ctesiphon. ^ Boiy, T. Late Achaemenid and Hellenistic Babylon. Peeters Publishers. 2004: 101. ISBN 978-90-429-1449-0. Stronach, David "Anshan and Parsa: Early Achaemenid History, Art and Architecture on the Iranian Plateau". In: John Curtis, ed., Mesopotamia and Iran in the Persian Period: Conquest and Imperialism 539-331, 35-53. London: British Museum Press 1997. Dandamaev, M.A. A Political History of the Achaemenid Empire. Leiden: Brill Academic Publishers, 1989 (ISBN 978-90-04-09172-6).